BSNL to extend a helping to the people of Chennai offers Free of cost services from Landline and Broadband services. State owned Telecom Company Bharat Sanchar Nigam Limited (BSNL) to help Chennai flood people hit that caused chaos in the city BSNL will not charge on BSNL voice call bills for a period of seven days from BSNL Landline and Broadband services. 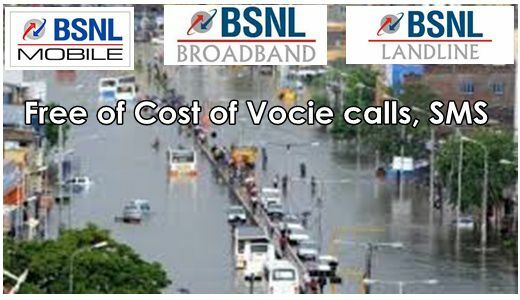 The free of cost voice calls offered within the network i.e BSNL to BSNL or for calling on some other Telecom network. As well customers can also avail 100MB free data usage with effect from 3rd December, 2015 for one week. Whereas, Under BSNL Mobile plans services all Local and STD voice calls on BSNL network will be free of cost with effect from 2nd December, 2015 onwards. In addition BSNL offers Free SMS (On-net) and Fred 100MB of free data package will be offered from the morning of 3rd December, 2015 for a period of seven days under Prepaid plans mobile services. BSNL at the same time for Postpaid users there will be rental rebate of seven days and extension of billing cycle by 15 days.